We are hereby putting photographers in Vermont, South Florida, and the rest of the world on notice that we plan to corner the market on Cheez-It inspired dudoir sessions occurring in the middle of a wedding day, like this one in Broward County, Florida. Before and after this unique and unforgettable sequence of events, this wedding day at the Hillsboro Club was a classy and stylish affair. Views of the nearby Hillsboro Light, the first Lighthouse south of the famous one in Jupiter, FL, provided a stately landmark that always seemed to work its way into photos perfectly. The Hillsboro Club was an ideal beachside venue, providing a combination of ample hotel rooms for guests, a ballroom with expansive glass walls showcasing the idyllic surroundings, a deck overlooking the ocean for the ceremony, and multiple cabins for family lodging, which we also used as a first look location. The wooden ceremony deck was large enough to allow for an angled aisle, leading to a floral arbor with the beach, ocean, and lighthouse all visible to everyone present. It also had beach access, which enabled the couple to have a bonfire on the sand after the conclusion of the festivities. The bridal party had their hair styled and makeup applied in a nearby house that is a part of the club, but the couple’s room for the evening overlooked the ceremony site from its vantage point directly above the reception. This would serve as the space for one of the most epic unplanned series of groom portraits we have ever been privy to. This image requires a backstory, since Cheez-Its are not exactly synonymous with matrimonial bliss. The bride-to-be knew her fiancé had a penchant for loving this particular snack food and decided to incorporate it into her gift giving. She bought a watch as the groom’s present and wrote a heartfelt card, then had them delivered in a quirky and creative way. She went to Costco and bought the largest case of individually wrapped Cheez-It snack packs she could find and hid the watch box inside. Steve was in the room to capture the groom's reaction to unwrapping his gift, which involved an uncontrollable smile from ear to ear, occasionally garnished with a happy tear. We give the bride an enormous amount of credit for knowing her significant other so well, and for crafting such a personalized and innovative way to wrap a present. In case you cannot tell already, this groom is awesome. His outgoing personality mixed perfectly with Steve’s, and this ridiculousness is what happens when an idea presents itself and is acted upon immediately. With ample time before they were expected at the First Look, these images started off silly, and then devolved into hilarity. The first concept involved having the groom grab an armful of the Cheez-It bags and cheerfully toss them into the air, grinning the entire time. 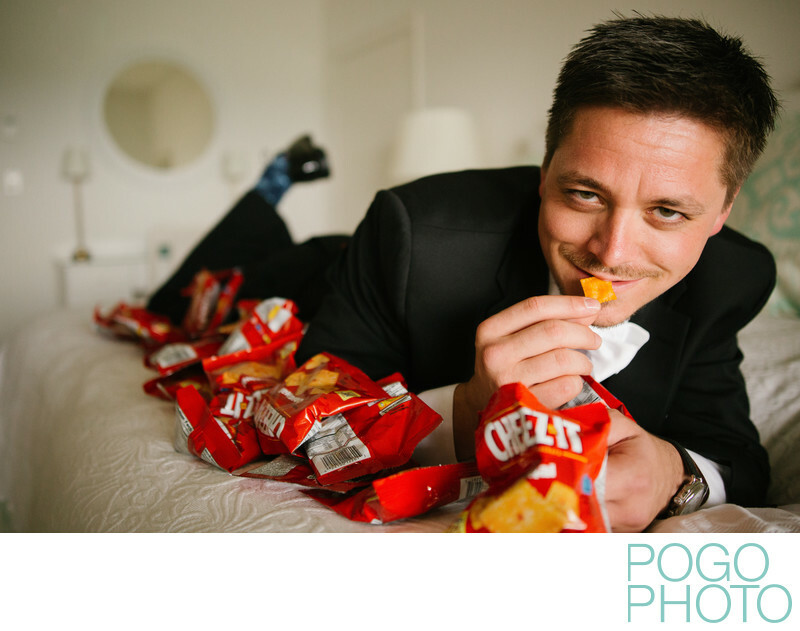 The groom crawled onto the bed, which by then was covered in dozens of bags of Cheez-Its, and Steve artistically placed the snack pouches around him while both of them laughed hysterically. Changing the angle dramatically, the groom began channelling his inner lingerie model, striking seductive poses in the most feminine way a goateed man in a three piece suit could. There are other, shall we say, remarkable images from this series, but those are not getting put up on the internet anytime soon. The groom walked directly from this room to his first look, transitioning from hysterical debauchery to emotional ecstasy in about eleven minutes. We kept the entire thing a secret from the bride and she did not find out about any of it until they saw their wedding photos for the first time. We were there and her reaction was somehow even better than we imagined. Cheez-it inspired wedding day dudoir photography is one term we never thought we would encounter, but it was one of the most comical moments of that season, and one we will never forget. Location: The Hillsboro Club, 901 Hillsboro Mile, Hillsboro Beach, FL 33062. 1/200; f/2.0; ISO 2000; 29.0 mm.